I love Mexican food and I love rice. 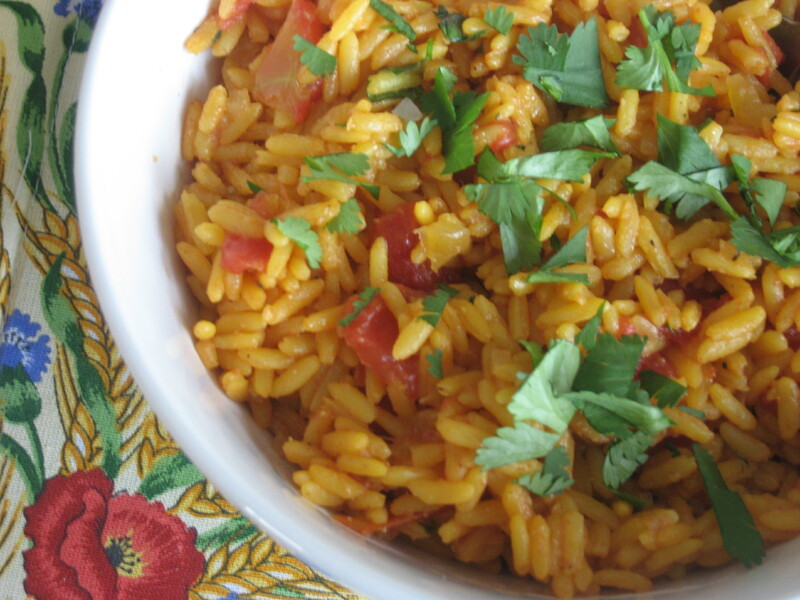 So of course, Mexican Rice is my favorite thing to have on the side of a great Mexican meal. There are a million and one recipes for this, but this is the one I adapted that works best for me and my family. It is simple and delicious! Give it a try! Finely chop your onion. Place the tablespoon of butter into a large skillet and turn the heat to medium. Dump in the onion and sauté until translucent. Pour in the diced tomatoes, with the juice and stir to combine with the onions. Add in the rice, cumin, salt, Goya Sazon, and some freshly ground black pepper and chicken broth. Stir until combined and then cover. Reduce the heat to low and let it simmer until the rice is tender and the liquid is absorbed. This should take about 20 to 25 minutes, but depending on the rice, can take a bit longer. Just before serving, pour in the quarter cup of fresh cilantro and stir gently. Garnish with some additional freshly chopped cilantro. That looks like high-end restaurant quality, Pam! We are Mexican fanatics, too. So, this ought to go over well with the Cave Clan.